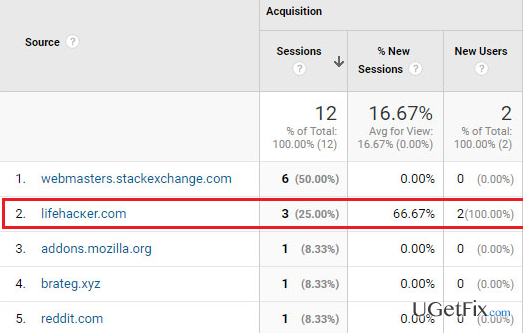 How to remove Lifehacker.com referral spam from Google Analytics reports? Home »	Optimize » How to remove Lifehacker.com referral spam from Google Analytics reports? Issue: How to remove Lifehacker.com referral spam from Google Analytics reports? I can’t figure out why Lifehacker.com shows up as a referrer on Google Analytics reports. In fact, my website has nothing in common with this page and I can’t find clues why this website drives traffic to mine. Although I’m glad about an increasing new visitor’s rate, I’m a bit curious and suspicious at the same time. Maybe you, guys, have heard something about this page? Would highly appreciate any information regarding Lifehacker.com. Thanks! Lifehacker.com is a legitimate online blog owned by Gizmodo Media Group. The site covers articles related to “Tips, tricks, and downloads for getting things done.” However, if you have started noticing Lifehacker.com URL as a referrer domain in your Google Analytics reports, then we are talking about an entirely different website, which is not associated with the real one. Online security experts have discovered another set of referral spam domains, which exploit the names of legitimate websites. Lifehacker.com is one of them. Therefore, if this domain name is embedded into Google Analytics stats, you should not check it because has a modified K letter, so visiting this URL may redirect your web browser to a useless third-party website, at best. 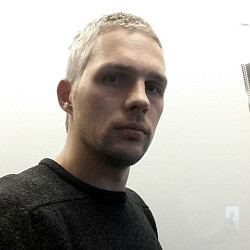 Referral spam, as a branch of spam, has been developed by a Russian spammer Vitaly Popov who considers Google Analytics spam as a “creative marketing.” Security experts express a different viewpoint towards such activity and claim that it’s a “black hat SEO” implemented by deceiving people and posing a risk to their cyber security. Lifehacker.com referral spam and other domains that compose “Ghost traffic” in Google Analytics are implemented with the help of computers, which generate fake hints and sent them directly to Google Analytics accounts. For this purpose, a spammer needs to know Google Analytic’s property ID, which people often reveal publicly. Having this in mind, we would highly recommend you to keep this ID password protected. Lifehacker.com referral traffic is spread with an intention to attract people’s attention and make them visit the associated URL address. That’s why its bounce rate typically reaches 100% or near it. This way, third-party websites manage to attract traffic to unpopular websites, which, in the worst case, may even contain malicious code. While, in general, referral or Ghost traffic does not have a negative impact on your website because it neither steals traffic nor has a contact with your website at all, Lifehacker.com fake referrer changes Google Analytics data, thus making it difficult to monitor the website. Therefore, to block Lifehacker.com referral spam from your Google Analytics data, you have to filter it out, which is not difficult to do. Select Admin -> All Filters. Later on, enter New Filter and type Lifehacker.com in the Filter Name box. Lastly, in the Filter Pattern field, type Lifehacker.com and click Save.